Bionomic Industries, Inc., an industry-leading manufacturer of proven air pollution abatement, product, and heat recovery technologies, has announced availability of their latest concept, the high efficiency Series 5000 Counter Current Packed Tower Scrubber with increased versatility. 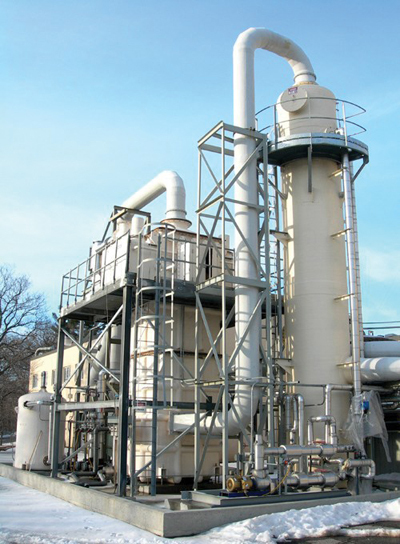 Series 5000 Packed Towers incorporate Bionomic's maximum throughput Hi-Flow(TM) random or structured packing, high efficiency mist eliminator designs, and a variety of clog resistant liquid distribution systems match engineered to more precisely meet specific application requirements. An optional dual packed bed arrangement enables removal of multiple contaminants using different scrubbing reagents within the same unit. Engineered for use with water, reactive chemical reagents, or special solvent scrubbing liquids to reduce costs and recover or minimize liquid waste, the scrubbers provide up to 99.9% removal efficiency and are available in a full range of sizes for gas flow rates from 30 cfm thru 300,000 cfm.